Hello Friends! I'm baaaaack! Yes, it was a short little camping trip but we decided not to do the full week as planned since we'll be camping again at the end of September. Besides, I don't think our backs could handle sleeping on the air mattress any longer! And I don't think I could have gone one day longer without taking a shower. Yuck! I think of all the trips we've ever taken - camping and otherwise - this camping trip was the first time that we've all come home completely happy and oh so relaxed! I also have to say that it was the best camping experience that we've had so far, even the Munchkin didn't want to come home! Aside from the tantrum the first night (which could have been prevented but we were all pretty tired), the rest of the trip was tantrum free and the Munchkin was in the best of best moods. It's amazing just how calming nature can be on a little one! It was mine and the Munchkin's first time camping at Little Qualicum Falls. It's now definitely one of my favourite places to camp. If it wasn't so riddled with spiders (seriously, there were about 8 different species of spiders in the outhouse alone! ), I'm sure Little Qualicum Falls would be at the very top of the list. We had scored a site right by the river, which the Munchkin absolutely loved and Brett even managed to catch a handful of crayfish from! We went on hikes, ate tons of S'mores, blew 2 bottles worth of bubbles, had adventures with the Munchkin's remote car, and even snagged some much needed down time for everyone! I know, can you believe that for a glorious half hour the Munchkin chilled out in the tent all by himself just lying on the sleeping bags and chatting with his Mario and Luigi stuffies? He did. And while the Munchkin was having his "me time" Brett had his own quiet time by the river catching crayfish, and I sat by the fire and finished one of my Badass socks! It was absolute bliss! But now we're home and there's so much to do! I've got piles and piles of (stinky) laundry to wash, coolers and sleeping bags to air out, groceries to buy, bills to pay, emails to answer, mail to sort, and packages to pick up and ship off...just to name a few! Phew, it's going to be a busy weekend I tell you! I also want to thank you all for entering the Badass Giveaway! I honestly thought I would get maybe a handful of entries, so the response was overwhelming and wonderful! 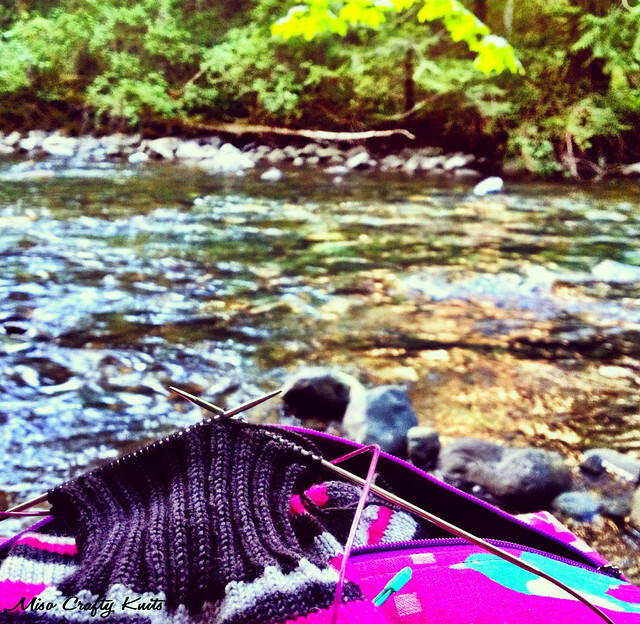 I loved reading what everyone likes to knit and what you want (and wish you could) knit. The winner has already been randomly chosen and an email has been fired off. The winner? I really hope Cheryl responds to my email soon before I have to pick a new winner! I would hate to see this awesome skein of Everything Old Signature Sock Domestic Badass go unloved and be homeless! Ok, I'm being overly dramatic here. It's not unloved cause I love it to death, and I'm pretty sure it would never be a homeless skein of yarn. Anyhoo, both the scary piles of laundry and the Munchkin are calling my name. I better go attend to both...and see how much of the to-do list I can tackle today! I hope you all had a wonderful week and will continue to have a fabulous weekend...it's the last of the summer! Little Qualicum Falls is gorgeous! I can't wait to go back!